The National Academy of Science estimates that more than 36,000 imaging procedures are performed daily in departments of nuclear medicine in the U.S. Radiopharmacists prepare (formulate) and deliver radioactive pharmaceuticals with incorporated isotopes that spontaneously emit radiation that are used in these nuclear medicine scans. These agents are used in the diagnosis, evaluation and treatment of diseases such as cancer. The radiopharmacy field has a rich history in New Mexico, with the early pioneers in the 1970s being faculty and graduates from the UNM Health Sciences Center College of Pharmacy (UNM COP). Partnering with the Division of Chemistry and the Los Alamos Neutron Science Center (LANSCE) Isotope Production Facility (IPF) at the Los Alamos National Laboratory (LANL), the New Mexico Center for Isotopes in Medicine (NMCIM) was established in 2005 to lead in the development of the next generation of radiopharmaceuticals. The Director of the NMCIM and Principal Investigator of the TRC award, Dr. Scott Burchiel, is a pharmacologist with experience in the development of antibody-based imaging agents that have been developed by pharmaceutical and biotech companies over the past 20 years. NMCIM has an Executive Advisory Board chaired by the Dean John Pieper of the UNM COP and other distinguished members, including Dr. Robert Atcher of LANL, vice president-elect of the U.S. Society of Nuclear Medicine. New Mexico Governor Bill Richardson hosted a formal collaboration signing ceremony in 2005 between UNM and LANL by former UNM President Louis Caldera and LANL Director Pete Nanos. NMCIM is a result of a more than 25-year research and education collaboration between the UNM COP and LANL. Other NMCIM partners include the UNM Cancer Research and Treatment Center, UNM School of Medicine, and the Lovelace Respiratory Research Institute. NMCIM programs leverage millions of dollars in infrastructure that are in place at UNM and LANL. The funding provided by TRC will enable NMCIM to develop commercial partnerships with companies such as GE Healthcare, who is collaborating with UNM and LANL investigators on the development of new imaging agents. Partnering with the UNM Cancer Center, NMCIM investigators were part of a successful scientific team led by Dr. Larry Sklar that received a $1 million grant from the Keck Foundation to purchase new state-of-the-art small animal imaging equipment including Single Photon Emission/Computed Tomography and positron emission tomography (PET) imaging. Dr. Jeff Norenberg, Associate Director of NMCIM, has already received contracts for small animal imaging studies focused on hardware and software development. Two NMCIM investigators, Dr. Norenberg and Dr. Yubin Miao, have also recently received funding from LANL for collaborative studies through the Joint Science and Technology Laboratory funding mechanism. The current TRC project focuses on the development of a PET imaging agent, gallium-68 (68Ga), that can be linked to tumor targeting peptides that bind to cancer cells. 68Ga, which can be produced from a germanium-68 (68Ge) generator source, is made at LANL. A 68Ga generator will provide point-of-use based diagnostic radiopharmaceuticals that will be useful in the diagnosis of human disease, especially cancer. Most current PET imaging agents must be produced by cyclotrons that are located immediately adjacent to imaging facilities, limiting the availability of this imaging modality to large medical centers with in-house cyclotrons. 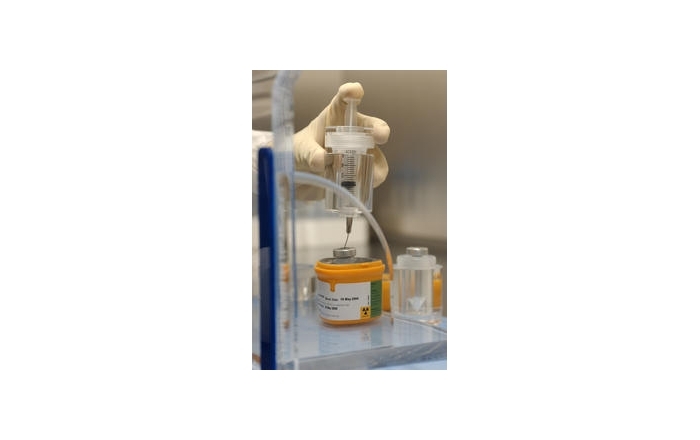 A 68Ga generator will allow radiopharmacists to chemically couple the radioisotope to a variety of different imaging agents for immediate use. The technology has sufficient commercial interest that GE Healthcare has agreed to collaborate on the early development and testing of 68Ga-based radiopharmaceuticals. GE Healthcare is a $15 billion per year international corporation that designs and markets clinical imaging equipment, operates PET Centers in the U.S. and worldwide, and develops radiopharmaceuticals for imaging and therapy, which is estimated to be a billion dollar annual business. PET is the fastest growing imaging modality in the U.S. and elsewhere in the world and therefore there will be ready markets for new and improved imaging agents. NMCIM plans to develop the technology that will allow production of 68Ga radiopharmaceuticals via the commercial availability of a 68Ge/ 68Ga generator. This task will be led by a team of inorganic and radiochemists at LANL (Drs. Michael Fassbender, Jonathan Fitzsimmons, John Gordon, Kevin John, Gene Peterson and Wolfgang Runde). Following successful production of a generator, Drs. Norenberg and Miao will radiolabel two different types of tumor-targeting agents with 68Ga in partnership with Dr. Jean-Luc Vanderheyden at GE Healthcare. 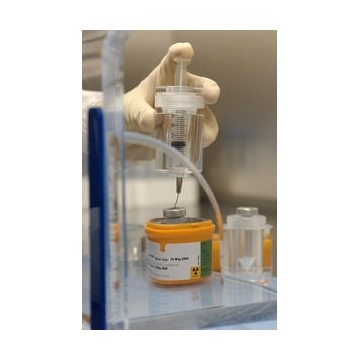 These tasks will also involve the labeling and testing of commercial kits used to evaluate performance in preclinical (animal) studies and experimental models of cancer. The marketing and strategic business planning will be accomplished under the leadership of LANL’s Dr. David Pesiri and Dr. Duncan McBranch, Technology Transfer Division Leader. NMCIM will protect the intellectual property associated with its activities at UNM and LANL, and will develop partnership opportunities for locally, nationally and internationally recognized companies, universities, including UNM, New Mexico State, New Mexico Tech and New Mexico Highlands. NMCIM will also create partnership opportunities with research institutes, such as Lovelace Respiratory Research Institute. Overall, the current TRC project represents a new and unique collaboration between NMCIM, LANL and GE Healthcare that will work on developing the Next Generation 68Ga Radiopharmaceuticals through the commercial availability of a 68Ge/ 68Ga generator. For further information please see the NMCIM web site.